Why are more and more men and women moving on from a bit of botox and going ‘down the fillers road’? Read on now to find out why! I have been performing non surgical injectable treatments like botox and fillers for the past 10 years in my clinic on Merrion Square in Dublin and on Harley Street in London. 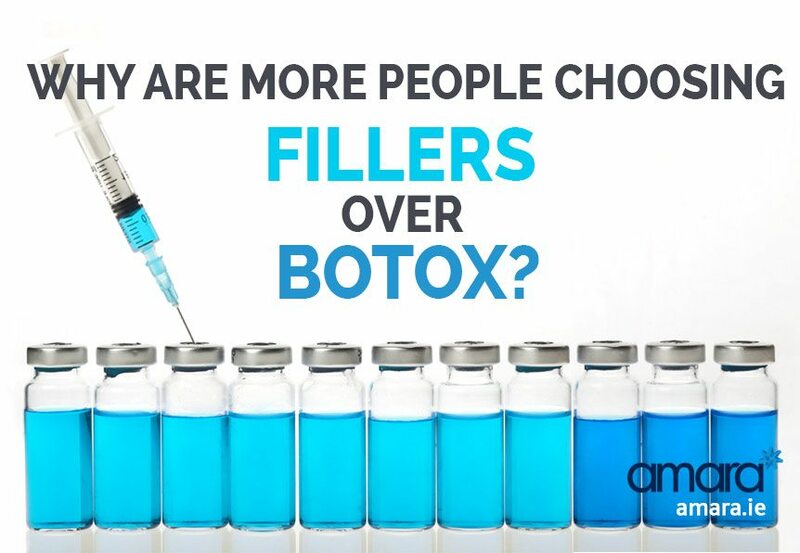 Over the years I have noticed a shift in popularity from botox to fillers. Years ago, when I first started, I noticed that many of the people coming to me for treatments weren’t newbies. Even though it was only 2005 and botox had only been licenced officially for a few short years, a lot of these patients had been having Botulinum toxin treatments for much longer. Some of these people had had 10-20 botox treatments, but never had one filler. ‘oh ok nevermind, I don’t want to go down the fillers road’. Over the years, as I attended conferences and training sessions, I watched with amazement as some of the best injectors in the world wowed audiences of doctors with new techniques and treatment styles. We would watch open mouthed as the technology behind fillers got better and better. The treatment practices became more and more standardised and simultaneously more complex. No longer was it just a case of plumping lips or correcting a nasolabial fold, but advanced treatments in temples, brow lifts, and many different approaches for treating the lips, nasolabial folds and cheeks. In the first two years that I was injecting with fillers, I began to notice my own skill level improving as I performed more treatments and techniques. I had always done 1-2mls for patients and I was amazed by the results I was beginning to achieve and almost as amazed by the amazement of my patients. Mostly I was impressed with the difference small changes make to people’s lives. It sounds corny, but many times in my office over the years, I heard more and more people talk about a restored confidence that they had lost from small deteriorations in their appearance. This restored confidence really changed quality of life for people. 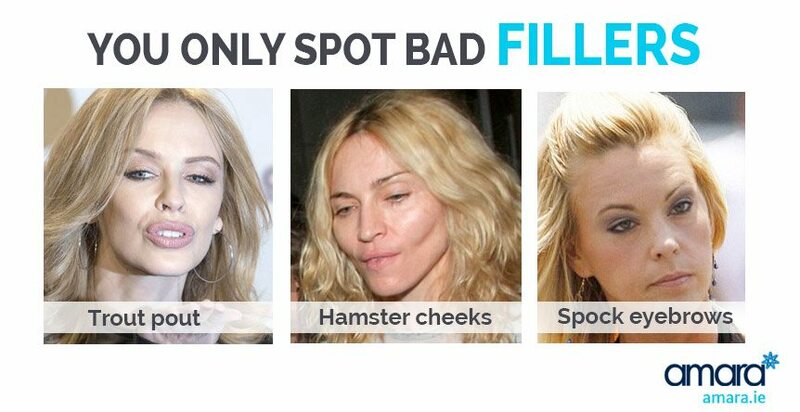 You Only Spot bad Fillers! Slowly but surely over the past few years the ‘down the fillers route’ expression has cropped up less and less. I now know why people used to see fillers as a road to ruin type of situation. Unfortunately when we look around us in our day to day lives, occasionally we see someone who has had definite ‘work done’. It occurs less frequently now, but I still see more trout pouts than I’d like to as well as Dr Spock eyebrows and hamster cheeks. See below! More surprisingly we occasionally see celebrities looking overdone! How is this possible we ask, when they have access to big bank accounts and the best doctors in Hollywood? No wonder people assume that the more you have the worse you look. No wonder many people thought and some still think that it is inevitable that once you ‘go down the fillers road’ ultimately you are destined to one day look overdone! The reality is this is just not true. When performed by a doctor who understands the aesthetics of beauty and performed in moderate amounts, fillers can give natural results and can even make people look better than they ever did by augmenting weak parts of the face such as chin or cheeks. The problem is we don’t see the good work. When someone’s work is good, we assume they’ve aged well. When someone looks bad, we blame their cosmetic work and vanity. Celebrities with too much work done are unfortunately in the unique situation of having careers that require them to look perfect and having the money to spend on every possible procedure to try and achieve it. (their income is often directly proportional to how well they look). This means that there are many celebrities who can pretend to have never had a drop of botox or fillers, and amaze everyone with how great they ‘naturally’ look into their fourth and fifth decades and beyond. On the other hand, at the same bleeding edge of aesthetic medicine, there are some other celebs who aren’t quite so lucky. Unlike most women who just want to look a bit fresher or maybe even a few years younger, celebrities often demand decades younger looks from their doctors. And when even the world’s best doctors try to push botox and fillers to their limits, trying to make someone look 20/30 years younger, of course sometimes it doesn’t work out. Without mentioning names, we regularly see the poor celeb plastered all over the papers for weeks. Their new look, along with their supposed foolishness and vanity becomes the subject of international ridicule. But again, we only ever spot the bad fillers. Less is more used to be my motto in aesthetic medicine and this was how I could guarantee undetectable yet undeniable results for my patients. However I have had to change that a little. The least amount possible to make the change you want is the right amount. No more than needed is more… just enough is more! Catchy right? A little bit of everything will give a better result than a lot of one thing. So just like too much fillers can look unnatural, so can just treating muscle lines with botox or just treating the skin with pigment correction or glycolic peels. The best results, the real wow factor comes when we know how to do just enough of everything. Just enough of everything is more. Are you interested in going down the filler route? Call us today to arrange a consultation and we’ll give you just enough of everything you need!